The Spanish economy is growing, unemployment is dropping, the stock exchange has almost doubled in value over the last two years and OECD figures show that Spanish workers are now as productive as British workers are. These are not opinions; they are based on facts and figures from respectable sources. Spain is one of the best countries to teach English in Europe and one of the best countries for making money teaching English abroad. Spain has always been a TEFL hotspot country but the shine has tarnished over the last few years. Spain is beginning to shine again. Yesterday, one of Spain’s largest banks, BBVA, published growth figures. BBVA is a global financial group with a presence in over 30 countries, more than 109,000 employees and over 50 million customers worldwide. BBVA stated that the Spanish economy will grow 1.3% this year and 2.3% in 2015. We have a major bank saying that the economy will grow and figures showing that employment is growing. Is Spain’s siesta, lazy and unproductive stereotype still valid? Many of my fellow Brits may believe that it is but here are the shock results from the OECD. Here is a graph showing productivity over the last five completed years. It shows that Spain and the UK are technically tied when it comes to income per capita. The left axis is in thousands of USD. The graph highlights Spain’s progress over the last five years. 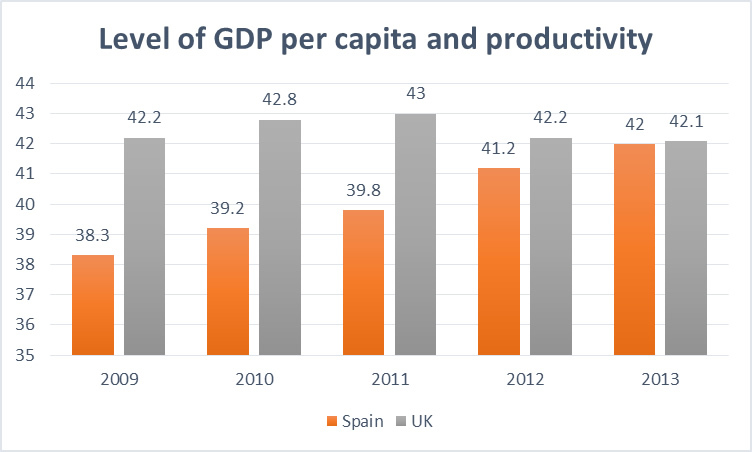 If the growth trend continues, Spain may well be ahead of the UK when the next set of annual figures are published in early 2015. What this means is that a British worker and a Spanish worker are more or less evenly matched when it comes to productivity. Spain lagged behind a few years ago but has been slowly catching up. If the progression shown by the OECD figures continues, year-end 2014 figures may show that Spanish workers are more productive than UK workers are. An interesting thought. There is no doubt that work habits differ between the UK and Spain. If productivity is the same in both countries, work habits are no longer an issue. Is Spain a good place to teach English abroad? Because of the bad press, Spain has a serious need for English teachers. There is a shortage. Many people have been scared off by international press doom and gloom stories but the facts and figures show these stories to be what they really are, untrue. Take a look at getting TEFL certified and teaching English in Spain. You can earn between 1,500 and 2,000 Euros a month (roughly 2,100 to 2,800 USD) working 20 to 30 hours a week and have a comfortable life in Madrid.